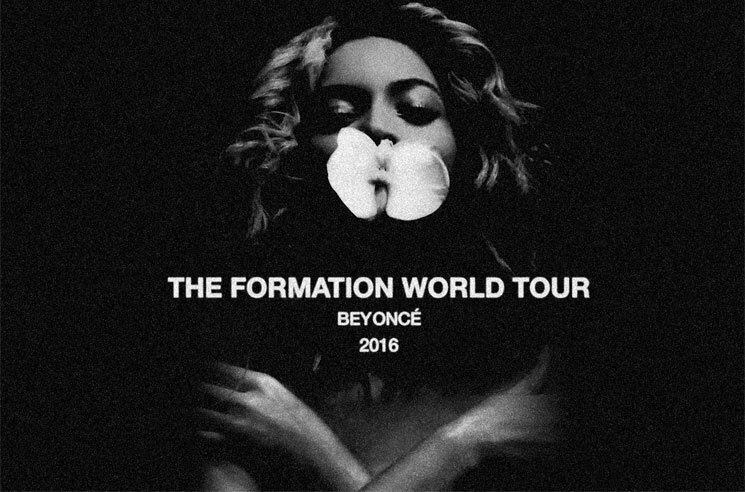 BEYONCÉ announced THE FORMATION WORLD TOUR today following her appearance during SuperBowl 50. The highly-anticipated tour, promoted by Live Nation, presented by American Express and produced by Parkwood Entertainment, will kick off in North America on April 27 in Miami, Fla. at Marlins Park with 21 additional stadium dates lined up throughout the country including New York City, Los Angeles, Chicago, Toronto, Philadelphia, Dallas and more. The European leg of THE FORMATION WORLD TOUR will start on June 28 in Sunderland, United Kingdom at Stadium of Light. Additional European stadium dates include London, Manchester, Zurich, Amsterdam, Paris, Milan, Stockholm, Frankfurt and more. A full list of tour dates and venues is below. Tickets will go on sale starting Monday, Feb. 15 in Europe and Tuesday, Feb. 16 in North America (full on sale schedule provided at end of release). Beyhive members may purchase tickets in advance beginning Tuesday, Feb. 9 and Monday, Feb. 15 for shows going on sale on Feb. 22. True to her life's work of always giving back, fans will be given the opportunity to participate in Beyoncé's #BeyGOOD initiative supporting local United Way programs and the continued work surrounding the water crisis in Flint, Michigan. United Way of Genesee County has been at the forefront of distributing thousands of filtration pitchers, faucet mount filters, replacement cartridges and truckloads of water to underserved populations to address immediate needs in Flint Michigan. They are also partnering with the Community Foundation of Greater Flint to create a fund that will address long-term developmental, education, nutrition and health needs of the children affected by the Flint Water Crisis. Follow @beygood on Twitter for more information. As Beyoncé wants to present her fans with the best possible experience at the concerts, she has joined forces with THX Ltd to provide the highest quality audio experience during THE FORMATION WORLD TOUR. THX has assessed, optimized and certified that the acoustic systems used at the concerts are without peer. With this association, concert-goers will get the best acoustic experience possible at any large-venue event. THE FORMATION WORLD TOUR is BEYONCÉ's first solo tour since her ambitious Mrs. Carter Show World Tour in 2013. The sold-out tour spanning two years and five continents thrilled nearly two million fans and was hailed by critics worldwide. During the summer of 2014, BEYONCÉ and JAY Z launched the six-week ON THE RUN Tour, playing major stadiums in the US. They ended the tour in Paris, France in September 2014 with two additional dates that were filmed for an HBO Special that was nominated for an Emmy Award. "American Express has a longstanding relationship with Beyoncé and we are thrilled to partner with her again for the upcoming Formation World Tour," said Walter Frye, Vice President, Global Experiential Marketing, American Express. "We are proud to bring our Card Members around the world closer to Beyoncé – a global icon and an artist we know they love – with access to purchase tickets for her tour before the general public." American Express Card Members can purchase tickets for Miami, Tampa, Dallas, San Diego, Los Angeles, Edmonton, Toronto, Chicago, Boston, Philadelphia, New York, Baltimore & Hershey beginning Tuesday, Feb. 9 at 12:00 p.m. local through Sunday, Feb. 14 at 5:00 p.m. local. American Express Card Members can purchase tickets for Atlanta, Raleigh, Nashville, Houston, San Francisco, Seattle, Minneapolis, Detroit and Pittsburgh beginning Monday, Feb. 15 (at 12:00 p.m. through Saturday, Feb. 20 at 5:00 p.m. local. American Express Card Members can purchase tickets for Beyoncé's The Formation World Tour 2016 in the United Kingdom, Ireland, *France, Italy, the Netherlands, Sweden, before the general public from 12:00 p.m. Tuesday, 9 Feb. to 5:00 p.m. Saturday, 13 Feb (France pre-sale ends Friday, 12-Feb @ 5pm). American Express Card Members can purchase tickets for Germany before the general public from 12:00 p.m. Monday, 15 Feb. to 5pm p.m. Friday, 19 Feb. local time.